A variety of studies assess the impact of multinational enterprises (MNE) in developing countries. They mainly focus on the negative externalities of these companies. Therefore, this study focuses on the positive effects emanating from the presence of MNEs in developing countries. It is hypothesised that positive externalities resulting from MNEs have their source in the local embeddedness of the firm. The two case studies presented in this paper assess the embeddedness of Syngenta’s subsidiaries in Kenya and Colombia. The focus is on Syngenta’s potato production and related crop protection business. The study investigates the perspective of the company, the view of experts and the potential impact on smallholder farmers. The results show that in both countries Syngenta is collaborating with universities and other research institutions, governmental institutions, NGOs and the local private sector. Syngenta creates attractive skilled jobs for locals in both countries. The company positively influences its business partners in the area of standards and good business practices. Furthermore, farmers profit from the technologies and trainings provided by the firm or its partners. It can be concluded that through embeddedness, Syngenta understands the needs of farmers and can help to meet these needs, which in turn results in a business case for the company. A variety of studies cover some aspects of the embeddedness of multinational enterprises in developing countries. Usually, the focus is on social (Heidenreich, 2012) or political embeddedness (Fransen, 2013) but studies considering a holistic embeddedness approach are lacking. Furthermore, while many studies have been conducted about negative externalities originating from the activities of MNEs in developing countries (Bakan, 2004), positive externalities have been widely neglected. Accordingly, the research gap can be found in the positive externalities resulting from a holistic embeddedness concept of MNEs. This study focuses on positive externalities that are created by the MNE’s embeddedness in the host country. At the centre of this study is Syngenta and its activities related to the potato and crop protection business in Kenya and Colombia. The term embeddedness was first used by Karl Polanyi to define social relationships of pre-market economies, where resources were transferred without the use of money (Polanyi, 1944). The economic term embeddedness means that people’s economic activities are integrated in local culture, community and economic networks (Polanyi, 1944 and Granovetter, 1985). The embeddedness concept is a contextualisation of economic activity in social structures, culture, cognition and political institutions (Zukin and DiMaggio, 1990). A firm is locally embedded when it collaborates long-term with local companies, institutions, clients and employees and when its policy takes the local context and environment into account. The rationale of an MNE is to create value by using, creating, transferring and combining resources across multiple locations (Meyer et al., 2010). Each location is characterised by a specific institutional framework and resource endowment which leads to different opportunities and constraints (Meyer et al., 2010 and Kostova et al., 2008). Embeddedness allows an MNE to adapt to a location. This is the basis for an efficient value creation (Meyer et al., 2010). To become embedded MNEs can create and access a local network of contacts, which in turn facilitates access to local knowledge (Cantwell and Mudambi, 2005, Lane and Probert, 2006 and Burt, 1992). Local contacts and knowledge are crucial for a company to access resources and capabilities that otherwise would lie outside the company’s boundaries (Andersson et al., 2002). Embedded companies cultivate long-term cooperative relationships and seek long-term returns by collaborating with and therefore depending on others (Romo and Schwartz, 1995 and Dore, 1983). Furthermore, embedded companies are more likely to innovate (Andersson et al., 2002) which increases the possibility of value creation (Snehota and Hakansson, 1995 and Blankenburg et al., 1996) and consequentially opens space for new opportunities (Gulati, 1999 and McEvily and Marcus, 2005) and alliances (Kogut et al., 1992). Those benefits would be difficult to create solely with arm’s length relationships or vertical integration (Uzzi, 1997). Assessing the embeddedness of an MNE requires the recognition and comprehension of its multifaceted dimensions (Badry, 2009). Embeddedness can be segmented differently. One possibility are the six categories of embeddedness proposed by Halinen & Törnroos, who divided embeddedness into social, market, technological, spatial, temporal and political embeddedness (Halinen and Törnroos, 1998). Badry stated that the embeddedness dimensions should be designated and adapted to the intention of the research and conceptualised in each case study (Badry, 2009). For the case studies conducted in Kenya and Colombia we distinguished seven dimensions of embeddedness: social, economic, technological, environmental and infrastructural embeddedness as well as relational and structural and political embeddedness. Potatoes originate from the Andes and were domesticated around 8000 years ago (CIP, 2017a). Nowadays, potatoes are grown around the globe, mostly in temperate regions and consumed on regular basis by more than a billion people (CIP, 2017b). In terms of consumption, potato is the third most important food crop after rice and wheat (Ibid). China, followed by India and USA are the biggest producers. According to Devaux et al., potato is considered as very important for food security by the FAO (Devaux et al., 2014). Since potatoes are relatively easy to grow, have a high adaptive range, short vegetative cycles and are of high nutritional value, its consumption has increased steadily in developing countries (Devaux et al., 2014 and Gastelo et al., 2014). 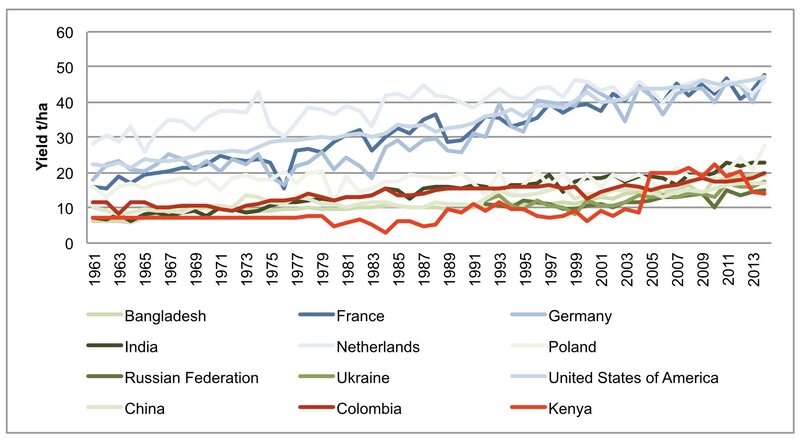 By now, potato production in developing countries exceeds that in developed countries (Devaux et al., 2014). However, yields differ substantially (Figure 1). Devaux et al. argue that potato production is gaining importance to eradicate poverty and improve food security and health in rural areas (Devaux et al., 2014). Moreover, potato is a very efficient crop with the highest yields per land area and water unit (CIP, 2017a and Devaux et al., 2014). Thus, the crop is of general importance, considering the pressure on global food production. Devaux et al. located areas where poverty and potato production coexist (Devaux et al., 2014). These areas included the potato producing regions of Kenya and Colombia (Devaux et al., 2014). They argue that interventions in these areas aiming at increased potato yields are of high importance since potatoes can serve as a staple food and cash crop for these farmers and in this way help them to escape food insecurity and poverty (Devaux et al., 2014). Potatoes are Kenya’s second most important food crop after maize (Janssens et al., 2013 and Muthoni et al., 2013). In Kenya, potatoes are grown as a staple food as well as a cash crop, mostly in high altitude regions with high amounts of rainfall. 800,000 smallholder farmers grow around 80% of the potatoes. Thus the cultivation of potatoes in Kenya contributes to the improvement of food security (Ng’ang’a, 2014 and Okello et al., 2016). Compared to countries with high-input production systems with yields of around 45 tons per hectare, the average yield in Kenya of 12 to 22 tons per hectare lags far behind (Economic Review of Agriculture, 2015); other sources even indicate average yields as low as six to ten tons per hectare (Okello et al., 2016). 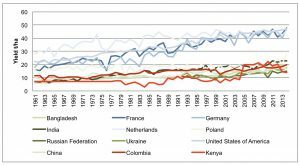 A big issue in Kenya is the usage of uncertified seeds, which keeps yields low (Devaux et al., 2014).7 However, Kenya is experiencing a rapid increase in potato demand (Janssens et al., 2013). This is due to population growth, changes in consumption habits and increased levels of urbanisation. In rural areas potatoes are consumed in traditional dishes, whereas in cities the demand for processed potatoes is high (Ng’ang’a, 2014). Farmers who are able to directly sell their potatoes to the industry receive much higher prices than farmers selling to local brokers or traders. The nominal prices are comparable to Swiss potato prices showing that potato is a crop with a high return on investment. There is evidence that processors in Kenya have difficulties sourcing potatoes that meet their high quality standards. Hence, they are motivated to engage with farmers and to start contracting them. Syngenta is one of the largest agro-business companies in the world. It is active in 90 countries in the fields of seeds and crop protection. More than 27,000 employees work in 107 production and supply and 119 research and development sites. The sales of the company are around 12.8 billion (Syngenta, 2017). Considering the size and reach of the firm, it becomes clear that Syngenta has a high-level influence on agriculture worldwide and thus on millions of farmers and consumers of agricultural products. Therefore, externalities originating from the company’s operations are of high interest. With its commitment to “bringing plant potential to life” Syngenta aims to increase agricultural productivity and save natural resources at the same time. The main goal of the company is to “improve global food security by making better, more sustainable use of available resources” (Syngenta, 2017). This should be attained through innovative crop solutions that transform the way crops are grown. At the centre of this research is the question of how well Syngenta’s subsidiaries are locally embedded in Kenya and Colombia and what kind of positive externalities (sustainability effects) result from this embeddedness. As there exists no ready-to-use method to assess embeddedness together with sustainability, these two case studies use a mixed method approach including different qualitative and quantitative surveys. First, a value chain analysis was conducted to find the important stakeholders concerning the potato business (upstream value chain) of Syngenta in Kenya and Colombia. The internal view of the company was provided by Syngenta in a subsidiary questionnaire. The external perception of Syngenta’s operations and collaborations in Colombia and Kenya was measured by an expert survey. The experts were asked about their perception of the extent and quality of embeddedness as well as the resulting sustainability effects. Four stakeholder groups were interviewed by means of questionnaires that included open and closed questions. The stakeholder groups included representatives from academia, business, government agencies and NGOs. In Colombia from 43 contacted stakeholders (experts), 15 completed the questionnaire. The same number of answers was received in Kenya. The small number of respondents prevented a representative statistical analysis but did allow a descriptive analysis. Because the operations of Syngenta influence smallholder farmers, these farmers were interviewed to indirectly verify the information gathered from the subsidiary and the expert survey. The smallholder questionnaire thereby served to assess sustainability effects on local communities, the environment and the local economy resulting from Syngenta’s activities. In Colombia data was collected from farmers in two of the major potato production departments of Cundinamarca and Boyacá. In this case, the smallholder farmer survey sample size was 20, containing ten households where at least one member attended Syngenta’s trainings (treatment group) and ten households where no one attended Syngenta’s trainings (control group). The farmers share the same geographical, agro-ecological and cultural characteristics. The small number of surveyed farmers reduced the power of statistical analyses. In Kenya farmers were not divided into a treatment and control group and the questionnaire was filled out in focus group discussions or individually. The sample size is 78, from which 18 individually filled in the questionnaire and 60 were interviewed in four working groups. Due to the research design, data was analysed in a descriptive way. According to Syngenta’s annual report 2016, sustainability and the creation of value for employees, the communities where they live and customers are at the centre of its business strategy. Through its so called Good Growth Plan the company has set clear targets in the areas of crop efficiency, soil degradation, biodiversity, empowerment of smallholder farmers, human safety and workers’ rights. These areas are also related to the sustainable development goals (SDG). Syngenta claims in its report that the Good Growth Plan is not a corporate social responsibility (CSR) initiative at the periphery of its operations but linked to its core business. Furthermore, it states that the company has a long-term view on technologies, which it develops to meet demand without resources being depleted. The results displayed below are extracted from an extensive questionnaire filled out by Syngenta Colombia, Syngenta Kenya and the Syngenta Foundation for Sustainable Agriculture (SFSA), which is active in Kenya. They refer to the activities of Syngenta in Colombia and Kenya and not to the general activities of Syngenta worldwide. However, Syngenta’s activities related to the potato production business in Colombia and Kenya can be easily connected to the Good Growth Plan’s commitments (e.g. Farmer Safety, Empower Smallholders, Resource Efficiency, etc. ), which is the global strategy of Syngenta. Syngenta started its activities in Colombia in the year 2000. The subsidiary has an annual turnover of USD 75 million and a market share in the Colombian potato business of around 22%. This means that it reaches about 20,000 potato growers. The subsidiary has almost 350 employees out of which 20 are working in the potato business. In this area 90% of the local employees are skilled workers. Syngenta Colombia has a programme for skills management and lifelong learning in which 20 employees could participate so far. A 100% employee working for the firm earns on average about 3500 USD a month whereas the national minimum is around 246 USD per month. Syngenta runs no special programme in the area of equality, gender and minorities but has a diversity and inclusion policy in all the work they do, internally and externally. Syngenta Colombia provides trainings to ensure the personal safety of its employees and suppliers. Furthermore, all business partners have to fulfil certain internal standards in order to collaborate with Syngenta. On the production side, the standards of the Fair Labour Association are followed. In order that suppliers fulfil the standards, Syngenta also provides trainings for them in this area. So far, 80% of its suppliers could be reached. Generally, Syngenta Colombia is following the ILO standards to fight corruption and promote transparency. However, in 2015 it started a strong promotion of compliance in Colombia through all its business areas including all suppliers. Overall, in areas where Syngenta has special programmes, it is working together with local entities. Whereas Syngenta used to develop its initiatives on its own in Colombia, it now works together with local partners in order to be supported with knowledge, people and resources and to share results. The integration of local partners is a slow but steady process and leads to the gain of local knowledge, which can be used to expand the business impact. Syngenta rates this collaboration as very important. Business relations concerning the potato business include 12 companies and four government agencies or NGOs. With most of the entities Syngenta with which is collaborating, it has formal contracts. In order to keep its license to operate, the department of Corporate Affairs within Syngenta maintains close relations with several governmental institutions. Additionally, Syngenta Colombia is part of an industry association called “Procultivos” in the case of crop protection and “Acosemillas” for seed issues. It is important for Syngenta to move away from charity programmes and to focus on local sustainability initiatives linked to agriculture, environment and safe use. Therefore, Syngenta collaborates with partners on the development of new technologies, services and products related to the potato business for the local market and provides regular trainings for potato farmers to facilitate the delivery of its technologies at the field level. So far, they have reached around 16,000 potato growers. Additionally, Syngenta has a special programme where more than 2,000 youths are targeted. Syngenta Colombia is reinvesting about 15% of its earnings in Colombia and it has growth strategies for its potato business in Colombia. Furthermore, it rates its performance in the area of provision of products and services to underserved markets as good. However, Syngenta sees the lack of a clear political framework in the agricultural sector as a hindering factor for investments from the side of Syngenta Colombia. Syngenta has set targets in the areas of air pollutants, greenhouse gas emissions, water consumption and withdrawals, water pollution and waste for the whole territory of the north of Latin America. The targets focus on production sites of the company (i.e. Cartagena). Furthermore, it has set targets to improve the quality of water, soil and air in areas where it is operating. In Colombia it participates in two programmes, “Ecoaguas” (water) and “Conservando mi Territa” (soil). These programmes are locally implemented in the agricultural zones. Through these programmes, best agricultural practices are brought to the growers, including potato producers. Syngenta Colombia has not invested in infrastructure so far but has plans to do so in the future. The only project related to infrastructure is the donation of computers to rural schools. However, this is more of philanthropic nature than an investment in infrastructure. Syngenta’s business development unit for the potato production sector was just recently created in Kenya. At the time of the study (2015) Syngenta Kenya employed 131 people in total of which three are related to the potato business. Nearly all local people working for Syngenta are skilled. The average salary of around 1300 USD is very competitive compared to the national average. The “Talent Development Program” which is run yearly offers specific trainings and possibilities for skills development to employees. Additionally, personal safety and security trainings are conducted. Furthermore, employees profit from medical health coverage, provision of cars and fuel, and a canteen. Syngenta Kenya complies with national and international standards. In addition, business partners must also uphold those standards in order to collaborate with Syngenta. In the areas of gender, minorities and diversity, Syngenta Kenya complies with Syngenta’s global ethical codex. However, Syngenta Kenya does not run special programmes in the area of human rights. Syngenta claims that its business partnerships and political interactions are corruption-free. Furthermore, Kenya has a legal framework that allows the enforcement of the law. This is an important framework condition for the company to operate. The compliance with the law legitimates Syngenta’s operation and increases its acceptance. However, Syngenta also tries to influence politics and decision makers. This is done via lobbying through trade associations. In the potato sector Syngenta is working closely together with local seed multipliers, the local logistics sector, cooperatives, farmer groups, processors, distributors, governmental and parastatal institutions. Over fifty public-private partnerships (PPP) are carried out (including the relationships of SFSA). Besides monetary support, the exchange of information, knowledge and technology, insight and understanding can be transferred. Through its contribution to the “Agribiz4Africa” event, Syngenta is supporting young people to establish their own business in the field of agriculture. Community development activities and other specific activities that are not directly business-related are carried out by the SFSA in collaboration with a variety of organisations. The activities serve to obtain local legitimacy and give Syngenta its license to operate. The common approach of the SFSA is similar to the one of international development organisations. The initiatives include “Operation Smile” and the “Mater Heart Run” which are purely philanthropic and not related to Syngenta’s commercial unit. Initiatives connected to the core business but which are also carried out by the SFSA include trainings and other services for farmers. The trainings cover subjects like best agricultural practices, basic profit and loss calculations, health and safe use of chemicals and environmental protection, use of new technologies and empowerment. To support farmers, the SFSA is closely collaborating with other agricultural development organisations, donors that contract NGOs, governmental organisations and local farmer organisations. The SFSA is also active in fostering entrepreneurship. Syngenta Kenya has a high number of business relations associated with potato production in Kenya. Most of these ties are formal. The most important technological innovation Syngenta brings to Kenya’s potato sector is the evaluation of new potato varieties. The business unit is engaged in the area of seed and tuber propagation and hence collaborates with local entities in this area. Furthermore, it is important for Syngenta to link farmers to processors. Farmers who are able to comply with industry standards and who are directly linked to processors receive higher prices for their produce. Additionally the procurement security for processors is increased and Syngenta profits by selling seeds and agrochemicals to these farmers. Syngenta does not run any infrastructure projects nor does it contribute to the implementation of any such efforts, since it does not perceive this as its responsibility. The following sections display the aggregated results from the expert interviews. While Figure 2 and 3 show the results obtained from the highly structured questionnaires, the open discussion with the experts is also considered. The survey is divided into four parts with questions about the extent and quality of Syngenta’s embeddedness, potential positive externalities appearing from the presence of Syngenta, and the embeddedness of Syngenta compared to other companies/competitors active in the region. The aggregated results of the perception surveys among experts are displayed in Figure 2. Each pentagon shows five embeddedness dimensions. On average across all expert groups, Syngenta is perceived as moderately embedded within the Colombian potato value chain besides in the area of infrastructure. Syngenta Colombia reaches the highest scores in the area of technological embeddedness followed by economic embeddedness. When considering extent and quality, experts perceive Syngenta to be a good employer and have a good collaboration with local research institutions and universities. Figure 2 Colombia: Aggregated results of the expert surveys. Furthermore, they see Syngenta as an economically stable entity that helps to improve the efficiency of potato production. Syngenta’s membership in national industry associations and umbrella organisations (e.g. Fedepapa) are perceived as positive economic embeddedness by experts. Comparing Syngenta to competitors like Bayer, Monsanto or Dow Chemical reveals that the experts perceive Syngenta as doing a little bit more in the technological dimension than its competitors, but doing about the same in the other areas. Also, the environmental embeddedness is identified by experts as moderate. Initiatives like “Ecoaguas, Suizagua Colombia” or “Conservando Mi Tierrita” are positively rated by experts collaborating with Syngenta in these areas. However, the externalities resulting from the initiatives of Syngenta regarding the environment are rated as only slightly positive. Further, experts perceive that Syngenta Colombia is not doing much in the area of infrastructure. Interestingly, experts think that Syngenta is doing about the same in this area as its competitors. It seems that the establishment of infrastructure is not a priority and should be provided by the Colombian government. The aggregated results of the perception surveys among experts in Kenya are displayed in Figure 3. Each pentagon shows five embeddedness dimensions. Figure 3 Kenya: Aggregated results of the expert surveys. Generally, Syngenta is also seen as moderately embedded in Kenya showing a fair to good performance in the different dimensions of embeddedness. Compared to other companies, Syngenta is perceived as doing slightly more than its competitors. The technological dimension – as well as the economic dimensions – scores highest. The technology Syngenta brings to Kenya (e.g. crop protection means, potato variety, trainings on good farming practices) is welcomed and has a positive impact on the productivity of potato farmers. However, Syngenta has no research and development unit in Kenya. The Ministry of Agriculture, Livestock and Fisheries (MoALF) observed that the demand for extension services was growing faster than the number of available extension agents from the government. Consequently, the MoALF welcomes private or public-private organisations doing trainings and perceives them to have a big impact on the livelihood of farmers. The extent of economic embeddedness is perceived to be between moderate and strong with an overall good quality and associated positive externalities. Farmers can get a high return if they follow the planting procedure suggested by Syngenta. Additionally, experts think that Syngenta has a bigger impact on agricultural development than the government. Business relations with Syngenta are considered to be stabilising and long-lasting and therefore worth pursuing. The extent of embeddedness in the environmental dimension is rated to be between moderate and strong and the quality is perceived to be good. Experts think that Syngenta is sensitive to environmental issues. Yet experts state that there are problems with the handling and storage of chemicals and the disposal of empty chemical containers. However, they see a decline in poor handling of pesticides despite the growing number of farmers using agrochemicals. Positive externalities in this dimension are mainly attributed to the offered trainings about environment, health and safe use of chemicals, and agricultural practices. Compared to its competitors, experts rate Syngenta’s performance to be clearly better. The social dimension is considered to be moderately embedded with a good quality. The most frequently cited positive externalities are knowledge transfer and the long-lasting relationship, which creates trust among stakeholders. Respondents from academia and NGOs voice criticism that the SFSA is used as a vehicle to create trust among stakeholders and to pave the way for Syngenta’s commercial unit, which is then able to more easily penetrate the markets. Syngenta’s infrastructural dimension is perceived as not being embedded with a poor quality and no positive impacts. Interestingly, comparing Syngenta’s infrastructural embeddedness to competitors, experts perceive Syngenta’s performance as slightly better. The following sections show the results extracted from the smallholder surveys. Whereas the case study in Colombia considered a treatment and control group, in Kenya a more exploratory approach was chosen. Nearly all potato farmers use agrochemicals and/or included a certain degree of mechanisation in their farming practices. While only a few farmers experienced technological changes since the last growing cycle, more expect such changes in the near future. Furthermore, all farmers from the treatment group and half of the farmers from the control group use Syngenta’s products. In general, farmers state that the usage of crop protection means and pesticides leads to a reduced pest pressure, higher quality of potatoes and higher efficiency. A significant difference between the treatment and control group is found when asking farmers about their work efficiency. The treatment group responded that they work more efficiently compared to the same growing cycle a year ago, and they think this is due to the use of inputs and technologies. However, no difference can be found between the two groups when looking at the income. However, farmers from the treatment group tend to have a more diverse income and are more likely to grow multiple varieties of potatoes. For the majority of the interviewed farmers from the treatment group (eight out of ten) their relationship with Syngenta is based on mutual trust. For these farmers, Syngenta and the government – followed by research institutions – are the most important actors fostering economic progress and improving living standards in the long run. The control group identifies the government as the major actor supporting their future development. Regarding their well-being, farmers from both groups think that their well-being has improved compared to the last three years. However, while six farmers from the treatment group indicate Syngenta as one of the main contributors to their well-being, farmers from the control group tend to see the government or other factors as contributors. The treatment group is evidently convinced of the knowledge transfer through solid trainings provided by Syngenta. There is a tendency that farmers from the treatment group attended more trainings than the ones from the control group. More farmers in the treatment group stated to have discussed multiple topics in the trainings than from the control group. Both groups report positive impacts from the trainings on all the different topics. Especially the trainings on the environment, health and safety at work are seen as beneficial for the farmers. Also, the farmers from both groups state that they apply quite a lot of the lessons learned during the trainings on their farms. The questions focusing on the storage of the pesticides and the use of protective equipment show that farmers in the treatment group have a slightly better understanding and awareness of safety and health issues. In general, the farmers state that their knowledge about environmental issues increased due to the trainings. However, farmers that attended Syngenta’s trainings are clearly more aware and informed about environmentally friendly practices. Regarding aspects of food security, the findings indicate that both treatment and control groups did not experience food scarcity in the last three months, nor unhealthy meals. Farmers in both groups state that they spend on average around 30% of their income on food. The vast majority of both the treatment and control group have access to basic health services. Also a large percentage of both groups have health insurance. The housing situation of both the treatment and control groups is good. Access to electricity, water and sanitation is provided by the local government. Potato is seen as an opportunity by farmers, which often leads them to increase their potato plot size. Fertiliser and agrochemicals are the most commonly used technologies and all the interviewed farmers changed their agricultural practices in the last three years. However, the change does not automatically mean that they increased their usage of agrochemicals. Agrochemicals are attributed to higher yield and quality as well as the reduction of labour. The majority of farmers think that their economic situation will improve in the future. They link their economic success to the now stable political situation of the country and think that diversification, marketing and selling potatoes through farmer groups clearly increases their income. However, they also directly connect their improved economic situation to the products of Syngenta as well as to the trainings. At the same time, farmers also mention the high costs for the inputs required to achieve good quality produce and the labour intensity as constraints. Additionally, farmers state that their individual bargaining power is small and mainly buyers and brokers determine the price. Hence, they wish for stronger regulations in this area. NGOs and the government are expected to make the greatest contribution to the economic success of the farmers. Farmers claim that most trainings they attended were conducted by Syngenta, followed by the government and NGOs. Generally, farmers appreciate the high quality of the trainings and up-to-date knowledge that is transferred to them by Syngenta. On one hand, farmers value the close and direct contacts with the extension officers of the SFSA and the practical advices. On the other hand, farmers are aware that Syngenta is business-oriented and hence tend to view governmental extension services as giving more neutral advice. Trainings, independent from the executing organisation, are considered by farmers to have an impact on productivity and efficiency. Furthermore, farmers claim that the trainings have effects on their health through safe use instructions. Farmers also state that their knowledge about environmental issues has increased due to trainings. However, they argue that trainings on environmental issues were mainly organised by the government. Farmers are applying what they have learned and are willing to change their production system. Most farmers have access to basic health services and for the majority the nearest health centre is within walking distance. However, only around 30% have health insurance. Almost all farmers have access to a clean water source, but 60% have no access to electricity and around 70% use wood as the main energy source. The farmers wish for more support from the government regarding infrastructure. Only when it comes to infrastructure related to potato production, such as storage and cooling houses, do they wish that companies would become more active. Since the two case studies discussed in this paper focus on positive externalities created through the embeddedness of the company, these positive externalities are first and foremost discussed. This does not mean that no negative externalities result from the operations and activities of Syngenta in Colombia and Kenya. However, the study reveals that Syngenta has positive effects on the local community in these two countries. These positive effects are likely to result from the embeddedness of the company in the national and local context. While some of the positive externalities can be directly linked to the operation of Syngenta, others are more indirect. Since potato yields are rather low and smallholder farmers involved in the business tend to be poor in both countries under investigation, interventions that focus on the efficiency of the potato production are welcome. Hence, Syngenta can play an important role in improving the situation of these farmers. Through its presence in Colombia and Kenya, it creates jobs for local skilled people in its production plants and extension services. Syngenta is an attractive employer offering competitive salaries and other benefits to its employees. This is also recognised by experts. Furthermore, it follows national and international standards in the area of working conditions, health and safety and business relations. Thus, Syngenta’s business partners must also follow these standards. This creates a tickle-down effect of good operation practices and international standards and positively influences local businesses. In Colombia only the business unit of Syngenta is active, hence this case study focuses on the embeddedness and the resulting positive externalities relating to the core business of Syngenta. For Syngenta Colombia it is important to collaborate with local partners, especially in the area of research and development. Also experts rate the embeddedness in the area of technology highest. The membership of Syngenta in local associations can be rated as positive in regard to embeddedness, which is confirmed by experts. Since the core business of Syngenta is the sale of agro-inputs, its focus lies on initiatives linked to agriculture, environment and safe use of agrochemicals and not on charity programmes. Hence, the training of farmers using its products is at the centre. Farmers from the treatment group seem to receive more trainings than farmers from the control group although other entities are also offering trainings. Farmers that benefited from these trainings and use Syngenta’s products state that their work efficiency on the farm has increased. They connect the higher efficiency to the usage of agrochemicals and technologies, which leads to a reduced pest pressure and higher quality of their crops. Furthermore, farmers from the treatment group see a connection between their economic success and well-being and Syngenta. Thus, it can be argued that Syngenta’s operation positively influences the productivity of the farmers. This overlaps with the statements of experts. They rate the embeddedness of Syngenta in the area of technology and economy highest. Beside the general trainings of farmers, Syngenta Colombia collaborates with other entities in special programmes about water usage and soil conservation, which is welcomed by experts. Interestingly, there seems to be a perception gap between experts and farmers regarding positive externalities resulting from Syngenta’s engagement related to environmental issues. While experts state that Syngenta’s operations only provoke few positive externalities in this area, very clear differences can be found in the environmental awareness of the treatment and control group of farmers. Hence, the positive impact of Syngenta on the environment might be underestimated by experts. Since Syngenta is not engaged in the area of infrastructure, experts also rate its embeddedness in this area as low. However, the farmer surveys reveal that basic infrastructure is provided by the government. Hence, there is no urgent need and reason for Syngenta to become active in this area. In Kenya, besides the business unit of Syngenta, the SFSA is also active. The SFSA and Syngenta Kenya are legally different entities. While the foundation acts like a developmental aid organisation, the business unit is coupled to the economic success of its operations. Thus, the mission and focus of both entities are very different. This fact complicates the ability of this study to correctly interpret the results. Not only was the embeddedness of Syngenta Kenya assessed, but it is mixed with the embeddedness of the SFSA since the two entities closely collaborate with each other. In Kenya the SFSA is involved in community development activities and collaborates with a variety of organisations to carry out projects focused on the farmers’ needs, but also takes care of the training of potato farmers. In this way, the activities of the SFSA pave the way for the business unit to enter the market. The initiatives of the SFSA build up trust among local communities associated with the brand name of Syngenta. This is criticised by experts. The business unit is collaborating with local entities in areas related to its core business, especially in the area of potato seed propagation and logistics. In this area, Syngenta is seen as a stable business partner by experts. However, experts welcome the training offered by the SFSA, since governmental extension services alone cannot cover the request for trainings. Also, the farmers appreciate the trainings and especially the direct contacts with the extension officers. Overall, they link positive effects on their health and improved productivity to trainings. According to experts, farmers that follow the recommendations have a high return. However, farmers see the high input cost and labour as restrictive. The usage of inputs and mechanisation can help to solve this problem since it makes potato production more efficient. Nonetheless, potato is seen as a profitable crop and farmers tend to expand their potato production. Farmers think that their economic situation will improve in the future due to diversification and higher sales prices. Hence, the planned strategy of Syngenta to directly link farmers to processors might help to achieve better prices and addresses the need expressed by farmers to have better regulated sales prices. Furthermore, farmers link their economic success to trainings and the usage of Syngenta’s products. However, farmers wish for better seeds and agrochemicals. Here, the business unit of Syngenta can step in and bring the requested changes and technologies to these farmers. Some experts even claim that Syngenta might have a bigger impact on the development of the agricultural sector than the government. This indicates that Syngenta has close relations to important actors and understands the problems and needs of the farmers and can tackle them. This is also reflected in the collaboration between Syngenta and the local private sector in the area of potato seed propagation and overlaps with the perception of experts who rank the technological and economic embeddedness highest. Regarding the environment, farmers mostly associate trainings covering such issues with governmental extension services. Also, experts attribute only a moderate effect of Syngenta to the environment. In the area of infrastructure, Syngenta is not active. Generally, farmers expect the government to improve the infrastructure. However, they wish support from the side of the private sector and thus also from Syngenta for specific infrastructure connected to potato production. By looking at the case studies, it becomes clear that the economic and institutional framework conditions are very different in both countries. While potato is a traditional and well established crop in Colombia with decreasing area under production, it is on the rise in Kenya with farmers expanding their potato plots. Furthermore, the processing of potato is also growing in Kenya, whereas processors in Colombia are struggling to compete with companies from abroad. Additionally, Syngenta Kenya has the advantage of SFSA being active there and sponsoring activities that are carried out by the business unit in Colombia (e.g. farmer trainings). Hence, it is not surprising that the embeddedness of Syngenta in Kenya is generally ranked higher than in Colombia since it is hard for experts and farmers to distinguish between the activities of Syngenta Foundation and Syngenta Kenya. Nonetheless both studies show that Syngenta has a positive influence especially regarding technology and economic aspects on the livelihood of local people in Kenya and Colombia. In both countries, Syngenta is able to bring higher efficiency to potato farmers through its trainings and products. However, in Kenya a great contribution comes from the side of the SFSA and to a smaller extent from Syngenta Kenya. Potato production in Kenya and Colombia is having some major constraints that keep productivity low and the income of the potato farmers small. Hence, initiatives from the side of the private sector are welcome and needed to increase the efficiency of potato producers. The activities and operations of Syngenta in Kenya and Colombia have positive influences on the potato value chain of both countries. Syngenta creates attractive jobs for local people and positively influences the operation practices of its business partners through the implementation of standards. In this way, it avoids over-embeddedness and the uptake of negative practices such as corruption but spreads good business practices. This leads to a more sustainable value chain. Through its products and trainings it brings innovations to potato farmers and helps them to improve their production and quality of produce. This in turn might enable small-scale farmers in the future to connect to processors and to receive higher prices for their potatoes, which will help to improve the economic situation of farmers. Generally, access to innovations and technologies fostered by Syngenta makes the potato value chain more productive and competitive. It can be claimed that Syngenta is highly motivated to understand the needs and constraints of potato farmers who it targets with its products. Helping these farmers to overcome their constraints results in a business case for Syngenta. However, to understand and meet these needs, Syngenta has to collaborate with local partners and in this way embed in the country of operation. However, through the activities of the SFSA in Kenya, the need for embeddedness of the business unit is reduced. Through the close collaboration with the SFSA, Syngenta Kenya receives the necessary information and license to operate its business. Thus, Syngenta Kenya is locally embedded via the SFSA. In contrast, Syngenta Colombia has to directly engage at all levels, hence directly benefiting from its own embeddedness. Thus, it can be concluded that Syngenta is well embedded in Colombia and in Kenya as well, thanks to its close collaboration with the SFSA. This results in positive externalities for its employees, the private sector and potato farmers and improves the overall competitiveness of the value chain. Andersson, U., Forsgren, M. & Holm, U. (2002). The strategic impact of external networks: Subsidiary performance and competence development in the multinational corporation. Strategic Management Journal, 23(11): 979–996. Badry, D. (2009). Multinational companies in low-income markets: An analysis of social embeddedness in Southeast Asia. University of St. Gallen. Bakan, J. (2004). The Corporation – the pathological pursuit of profit and power. Free Press. Blankenburg Holm, D., Eriksson, K. & Johanson, J. (1996). Business Networks and Cooperation in International Business Relationships. Journal of International Business Studies, 27(4): 1033–1053. Burt, R. S. (1992). Structural holes: The social structure of competition. Industrial and Corporate Change, 17(5): 953–969. Cantwell, J. & Mudambi, R. (2005). MNE competence-creating subsidiary mandates. Strategic Management Journal, 26(12): 1109–1128. CIP (2017a). Facts and figures about the potato. Available online: http://nkxms1019hx1xmtstxk3k9sko-wpengine.netdna-ssl.com/wp-content/uploads/2017/04/Facts-and-Figures-Potato-Eng-2017.pdf. CIP (2017b). Why are potatoes important?. Available online: http://nkxms1019hx1xmtstxk3k9sko-wpengine.netdna-ssl.com/wp-content/uploads/2017/04/Why-are-Potatoes-Important-Eng-2017.pdf. Devaux A., Kromann P. and Ortiz O. (2014). Potatoes for Sustainable Global Food Security. Potato Research, 57: 185-199. DOI: 10.1007/s11540-014-9265-1. Dore, R. (1983). Goodwill and the Spirit of Market Capitalism. The British Journal of Sociology, 34(4): 459–482. Economic Review of Agriculture (2015). Ministry of Agriculture, Livestock and Fisheries. Republic of Kenya. Fransen, L. (2013). The Embeddedness of Responsible Business Practice: Exploring the Interaction Between National-Institutional Environments and Corporate Social Responsibility. Journal of Business Ethics, 115(2): 213–227. Gastelo M., Kleinwechter U. and Bonierbale M. (2014). Global Potato Research for a Changing World. CIP working paper No.2014–1. Granovetter, M. (1985). Economic Action and Social Structure: The Problem of Embeddedness. American Journal of Sociology, 91(3): 481. Gulati, R. (1999). Network Location and Learning: The Influence of Network Resources and Firm Capabilities on Alliance Formation. Strategic Management Journal, 20(5): 397–420. Halinen, A. & Törnroos, J.-Å. (1998). The role of embeddedness in the evolution of business networks. Scandinavian Journal of Management, 14(3): 187–205. Heidenreich, M. (2012). The social embeddedness of multinational companies: A literature review. Socio-Economic Review, 10(3): 549–579. Janssens, S. R. M., Wiersema, S. G., Goos H. & Wiersma W. (2013). The value chain for seed and ware potatoes in Kenya; Opportunities for development. LEI Memorandum: 13–80. Jiménez A. (2014). Cadena agroalimentaria de la papa y su industria. Ministerio de agricultura y desarrollo rural. Kogut, B., Shan, W. & Walker, G. (1992). The make-or-cooperate decision in the context of an industry network. Networks and organizations: 348–365. Kostova, T., Roth, K. & Dacin, M.T. (2008). Institutional theory in the study of multinational corporations: A critique and new directions. Academy of Management Review, 33(4): 994–1006. Lane, C. & Probert, J. (2006). Domestic capabilities and global production networks in the clothing industry: A comparison of German and UK firms’ strategies. Socio-Economic Review, 4(1): 35–67. McEvily, B. & Marcus, A. (2005). Embedded ties and the acquisition of competitive capabilities. Strategic Management Journal, 26(11): 1033–1055. Meyer, K. E., Mudambi, R. & Narula, R. (2010). Multinational Enterprises and Local Contexts: The Opportunities and Challenges of Multiple-Embeddedness. Journal of Management Studies, 48(2): 235–252. Muthoni J., Shimelis H. & Melis R. (2013). Potato Production in Kenya: Farming Systems and Production Constraints. Journal of Agricultural Science, 5. Ng’ang’a N.M. (2014). Analysis of price incentives for Potato in Kenya Technical notes series. MAFAP, FAO, Rome. Norton R.D., Angel A., Argüello R. Balcázar Á., Martínez H., Samancá H., Turner A. (2017). The Competitiveness of Tropical Agriculture, A Guide to Competitive Potential with Case Studies. Elsevier Academic Press. ISBN: 978-0-12-805312-6. OECD (2015). OECD Review of Agricultural Policies: Colombia 2015. Okello J., Zhou N., Kwikiriza N., Ogutu S. Barker I., Schulte-Gerldermann E., Ahmed J., and Atieno E. (2016). Welfare-environmental quality tradeoffs of promoting use of certified seed potato in tropical highlands of Africa: Evidence from central highlands of Kenya. Paper submitted to the 2016 American Applied Economics Association meetings at Boston. Polanyi, K. (1944). The great transformation: the political and social origins of our time. Beacon Press, Boston. Rodríguez D.R. and Ramírez L.N. (2011). La agroindustria de la papa criolla en Colombia. Situación actual y retos para su desarrollo. Gest. Soc. 4(2): 17–30. Romo, F. P. and Schwartz, M., 1995. The Structural Embeddedness of Business Decisions: The Migration of Manufacturing Plants in New York State, 1960–1985. American Sociological Review, 60: 874–907. Snehota, I. & Hakansson, H. (1995). Developing relationships in business networks. Routledge, London. Syngenta (2017). Annual Review 2016. Uzzi, B. (1997). Social Structure and Competition in Interfirm Networks: The Paradox of Embeddedness. Administrative Science Quarterly, 42(1): 35–67. Zukin, S. & DiMaggio, P. (1990). Structures of capital: The social organization of the economy. Cambridge University Press, Cambridge. The studies discussed in this paper were carried out by Daniele Polini (Colombia) and Luca Costa (Kenya) and not by the author. Part of the work of Daniele Polini and Luca Costa was used for this paper. Further information about the field study in Kenya can be found in: Costa L. (2016) Positive Sustainability Effects Resulting from Embeddedness. A Case Study of Syngenta’s Potato Business in Kenya. Master thesis, Agricultural Sciences, ETH Zurich, Switzerland. The case study by Daniele Polini (2016) on “Positive Sustainability Effects Resulting from Embeddedness: A Case Study of Syngenta’s Potato Business in Colombia”, CCRS, Zurich, is unpublished. This chapter is built on the work of Daniele Polini. It is a shortened and adapted version of a draft elaborated by D. Polini. Information gained from farmer interviews. For more information visit http://www4.syngenta.com/what-we-do/the-good-growth-plan. For more information visit http://www.acosemillas.com. For more information visit: https://www.syngenta.com.co/news/noticias/ecoaguas. For more information visit: http://www4.syngenta.com/site-services/our-stories/conservando. For more information visit http://www.operationsmile.org. For more information visit http://materheartrun.com. For more information visit http://www.fedepapa.com. For more information visit http://www.suizagua.org/b/colombia.